What was expected to be an arraignment, at which the Supreme Court would hear Liam Jurrah enter a plea, ended up being an adjournment. The wigged barristers laughed at the media present from four outlets. But at least our false expectations had exposed us to the excellent street art (pictured at left and below) by Nicky Schonkala and Ralf Haertel, as part of the Alice Desert Festival. 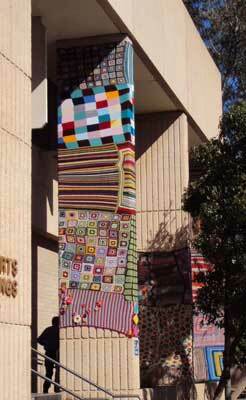 From a distance their ‘knit graffiti’, in bright colours and bold repeated motifs, resembles Aboriginal art. Up close it becomes clear that the artists have uncovered a new aesthetic purpose in that classic of fetes and op shops, the hand-knitted or crocheted blanket. 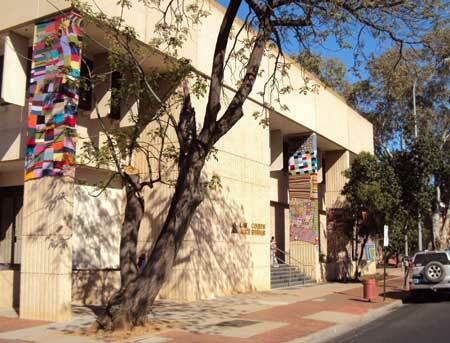 The work, which required a cherry-picker to install, has given the dour Alice Springs courthouse a transforming friendly face, but inside, its serious business goes on unchanged. In the Jurrah matter, all that happened, however, was that his bail conditions were altered, allowing him to reside also at an address in South Australia, given that his employer, the Melbourne Football Club, will be going into recess. Mr Jurrah (pictured arriving at court during the committal) will spend time with family over the summer, his legal representative John McBride told Justice Dean Mildren who granted the application. On July 25 this year the celebrated footballer from Yuendumu was committed to stand trial on a charge of assault causing serious harm as well as three further counts of assault on three separate victims. His committal hearing attracted national media coverage. His co-accused, Christopher Walker and Josiah Fry, will be tried with him. For Mr Jurrah and Mr Fry, arraignment will now take place on March 11 next year, with their 10-day trial starting the next day. Mr Walker, as his lawyer has previously said, will plead guilty to some charges, including the assault causing serious harm. There may be dispute over facts. This will be heard on October 29 this year. Mr Jurrah, dressed in dark suit and tie, appeared by video link from Melbourne. Mr Fry had been released on bail at the end of the committal hearing but is now in custody. He and Mr Walker appeared by video link from the Alice Springs gaol. Ian Sharp, maybe there isn’t enough knitted graffiti around! Phil, Nicky’s work does adorn the Mall, every Christmas. Tourists take photos of her work. We get lots of comments on our adorned bullbar. Maybe some of Nicky’s work could adorn The Mall as it is spruced up? Great article, lots of Nicky’s work around (including our front fence). Good to see it getting recognition. Nicky, you show a wonderful sense of fun and dare I say it, irreverance to our peceived stuffy institutions. Keep up the good inspirational work. Public Art at its best.